Vyomesh I. Joshi, President & CEO, 3D Systems [NYSE:DDD] Imagine a medical emergency, where a patient—while he is being prepped in an operating room—learns that he is the surgeon’s first-ever patient. In such a scenario, it’s no doubt that the patient and the doctor will share equally tensed moments during the entire process. To evade such scenarios, the surgeons in the world’s most advanced medical training institutions have extensive hands-on simulated experience prior to any form of patient interaction. Simulating a medical procedure on a realistic patient’s anatomy helps physicians acquire the practice that they need before they enter the OR. This builds a surgeon’s skills, procedural knowledge, and confidence before operating on a patient. Governed by a similar mission, 3D Systems [NYSE:DDD] works closely with leading physicians to develop a continuous improvement of a simulated environment and plays a crucial role in delivering hands-on medical procedural training for future surgeons. 3D Systems empowers clinicians with the most realistic hands-on experience in medical training through surgical simulators to confront Minimally Invasive Surgery (MIS) and interventional procedures, at no patient risk. 3D Systems’ medical simulators provide a safe environment wherein surgeons can commit errors and learn from practicing various cases and procedures. The company’s flagship product— Simbionix simulators—compare the learner’s performance against benchmarks so that educators can determine competence and assign more tasks and procedures until competence is achieved. 3D Systems is one of the few companies whose state-of-the-art technology solution provides a robust platform to learn and master critical medical and operational skills to ensure procedural efficiency and promote quality outcomes for medical professionals. 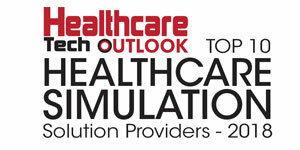 3D Systems’ simulators have found applications within a wide range of medical specialties and surgical procedures. These include laparoscopic, robotic surgery, ultrasound, endovascular, gastrointestinal, bronchoscopy, arthroscopy, nursing, OB/GYN, and urology, to name a few. 3D Systems’ end-to-end solutions deliver significant productivity gains to enterprises through innovative use of 3D technologies and expertise, catering to the aerospace, automotive, durable goods manufacturing, healthcare, and teaching environments to name a few. 3D Systems began the development of the Simbionix simulators with the mission to create a medical virtual reality for improving the physician training and patient outcomes. The company aims to create a virtual environment where physicians could learn the skills and procedures necessary for success in the operating room without the risk of training on a live patient. Committed to enhancing the clinical performance and optimization of procedural outcomes through education and collaboration, 3D Systems’ Simbionix simulators provide a complete solution for medical training programs. It is this commitment to medical education and ultimately their goal to improve patient safety, which is the driving force behind the Simbionix simulator product line. The company’s comprehensive education offerings include top of the line medical simulators and a simulation management system and patient-specific simulation. Developed in partnership with global medical experts, who play an active role in simulation design, content definition, and product testing and validation, the solutions facilitate end results that are most reliable, robust and effective in the realm of medical education training. Recent product releases include the use of virtual reality goggles where learners can have a fully immersive experience and “see” the entire surgical team, hear sounds and have a 360-degree view of the OR. Surgeons can also practice on a patient-specific simulation where MRIs or CT scans are imported into a simulator. This offers surgeons a chance to practice on a patient’s simulated anatomy before the actual surgery, maximize consistency to optimize learning, which provides a clear advantage over relying solely on historically available patient care opportunities. The company also works with institutions to devise a customized curriculum for medical trainees. Their highly innovative R&D department also developed D2P (DICOM-to- Print) software that is used by medical staff for preoperative surgical planning and the export of patient-specific 3D digital models. These 3D printed models are used to explain anatomy and procedures to patients, discuss the surgery with the surgical team prior to surgery, and train medical students, residents, and fellows. 3D Systems also works closely with medical device firms. Their medical device clients use customized simulators to train their sales and support staff on how their products are deployed inside the human body. Simbionix simulators show how patients will react to medical devices such as a stent or other surgical instruments. These companies can then go to institutions such as hospitals or medical facilities and train physicians in their specific methods, with the confidence of how the medical device will work. "Our challenge was to create medical simulation that provides trainees with practical feedback"
What has been setting the 3D Systems’ product line apart is the continual R&D development of new simulators and modules such as their advanced robotic surgery simulation offering. 3D Systems has recently demonstrated the MentorLearn—a web-based Simulator Curricula Management System—on mobile devices such as mobile phones, laptops, and personal tablets. The MentorLearn solution provides online access to the Simbionix simulators and allows users to perform administrative tasks with ease of use. The MentorLearn Cloud allows program directors to manage their Simbionix simulators via a cloud-based management system so that medical institutions can access the technology anytime, anywhere. The ongoing R&D development is backed by a support and service team who help clients in resolving any complications every step of the way. As the industry’s trusted leader in digital manufacturing, no other medical simulator company has such a wide range of products under a cloud-based education system. In addition, the company aims to continue its collaboration with the medical industry and medical societies from around the world. Clinical validations and thousands of Simbionix simulator installations prove that there is a need for highly realistic training simulation and that 3D Systems is the dominant leader in simulation technology.